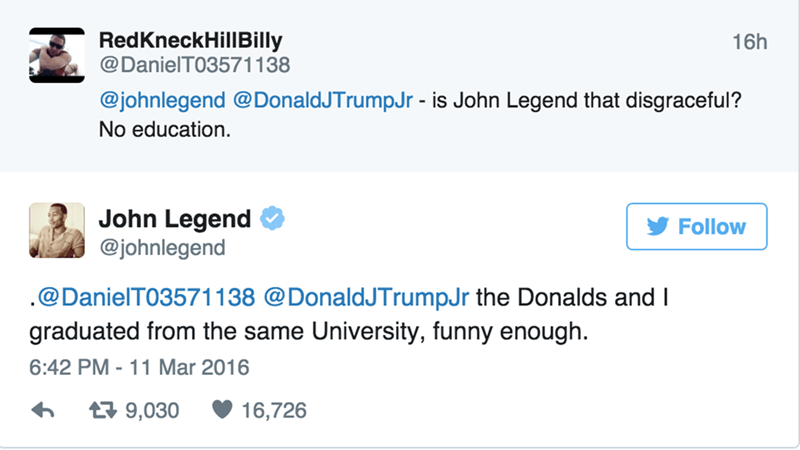 John Legend Explained to Donald Trump's Son Why People Were Protesting His Dad's Rally - The Daily What - Daily Dose of WHAT? Donald Trump's political rally in Chicago got shut down because of people protesting him. His son, Donald Trump Jr. responded with a claim that the protestors didn't know why they were even protesting. John Legend had a pretty simple answer for him. Because both Trumps went to the University of Pennsylvania, just like John Legend, and look where that got them.